In a skillet, brown sausage. Remove sausage from skillet. In a bowl, add eggs, salt, pepper and splash of water, whisk well. Pour eggs in skillet and add sausage. Gently fold eggs until cooked. 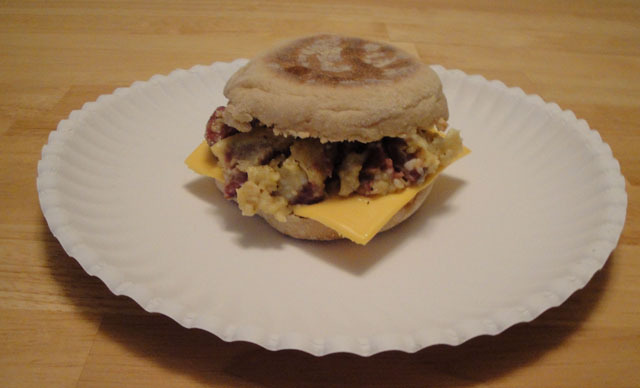 Spread mayo on each muffin, add cheese, egg and sausage. Enjoy! Now you may just get me to eat breakfast!! Thanks for sharing. Looking at this I may have to start eating breakfast..Thanks for sharing! Thanks for this information I all ways thought muffins came from America and were made popular by Mcdonalds. I never ate or heard of muffins till my twenties. I just love your history and thank you for your research. Food history is fascinating. Perhaps I live in the wrong part of England or lived a sheltered live. Your family has no excuse to go to McDonalds with a breakfast sandwich like this on the table! Nice post. Way better than egg mcmuffin ;D Yum !! Definitely way better than the other fastfood versions, this homemade breakfast look delicious! I would never, ever order one of these at a fast food restaurant, but I'd definitely make your version at home! YUMMY! I am not a breakfast person Christine but sure this sandwich can start my day with brunch. You bet the home version is healthy and more delicious. I need to make these at home more often. Great way to start the day. I'm not a breakfast person, I usually grab a cup of coffee and go. But I love breakfast food, and I like to eat breakfast food for lunch or dinner. Thanks to all for all the comments. Your comments make me happy. Good stuff! I've sent you some breakfast buzz! What a great idea my kids love these perfect timing they are staying overnight for Thanksgiving, an easy breakfast to make! Truth be told, I have not been all that partial to the muffin. Now breakfast foods, I could eat them daily.